© 1982, Doubleday & Co.
As excavation continued during the next three years in the area surrounding the shrine, the full history of Peter's grave steadily unrolled itself, enabling the excavators to piece together a remarkable record of devotion to the apostle's memory. Inevitably, as work progressed the operations became increasingly more difficult and delicate, requiring an ever slower and more painstaking approach. Often it became necessary, in order to avoid inflicting irreparable damage, for the workmen to burrow horizontally through the soil, rather than digging straight down through the floors, an approach that called for a good deal of patient shoring up. The small team of scientists kept faithfully at its task, however, and though these were the war years the internal affairs of Vatican City remained largely free of serious disruption. "The passions and varying fortunes of ," Monsignor Kaas later recalled, "scarcely disturbed the labors in the secluded and hallowed earth." First to be investigated was the earthen floor of the central chamber, now tacitly accepted as Peter's grave, though admittedly it was not in its original condition. The level of the chamber floor was taken down about three feet, the soil being passed out to workmen who put it through a sifter. While nothing further bearing directly on the question of Peter's body was found, each trowelful of earth did yield many coins, all dulled and blackened, most in a state of at least partial corrosion. Together with the stray coins recovered from aboveground in the chamber, and at various levels higher up, the total collected came to nearly two thousand. Immediately, specialists began a study of this hoard and, as expected, the dates of most of the coins were found to coincide with the whole period of Constantine's basilica, the fourth to fifteenth centuries. They came from almost every country of Europe, with Italy, France, and Germany predominating. Most significant was a batch of over forty from Imperial Rome, both bronze and silver, which proved to have been minted well before Constantine, in the first to third centuries (this total might have been much higher, but more than half of the eight hundred Roman coins found were far too corroded for precise recognition). The earliest coin was a bronze from the time of Augustus, minted at the latest by A.D. 14. There were two other coins from the first century, and four from the second. Since it was unlikely that coins would still be in circulation even fifty years after minting, these earlier coins were taken as evidence of a steady devotion to Peter's memory during that long and obscure period stretching backward from Constantine to the decade of Peter's burial. The presence of early coins in the central chamber, the grave itself, seemed positive that a way had been left open, perhaps from the very start, to permit some sort of contact with the body. Of even greater significance than the coins was the unraveling of the complex of other structures that lay around the shrine. Most of the elements in immediate contact with the red wall, it was found, bore a definite and close structural relationship, confronting the archaeologists with an unexpected challenge. In the end they succeeded in putting together an intriguing picture. 8. Plan of the second-century red wall complex uncovered beneath the basilica's high altar, with adjacent Roman tombs. The red wall when first built had indeed been longer, stretching or no less than twenty-six feet, an additional ten feet or so on either side of the remaining portion. At its southern end it had met the rear wall of another pagan mausoleum - of this only the foundations had been preserved - standing next in line to the Matucius tomb. At its opposite end, to the north, the red wall had been joined by another wall, set at a right angle, suggesting an enclosure. It was clear that a large rectangular area, equal in length to the red wall and about twelve feet in depth, had once stood here free and unoccupied. The entire floor of this open space had been covered by a paving of tiles, white with a green border, laid in part on earth-fill. The focus of this walled-in space, which actually formed a small courtyard, was the two-niched monument built into the red wall, heavy with its travertine shelf. On its reverse side, the red wall yielded discoveries of equal interest. Along its entire length there ran a narrow alleyway, six feet wide with a concrete floor. The far side of this alley was bounded by two small buildings, of which only the lower walls were still in place. One of these buildings was a tomb, and to the excavators' surprise and satisfaction it was found to be the mausoleum of the outspoken Flavius Agricola, whose pagan inscription had so upset its sixteenth-century discoverers. Heavily wrapped, Agricola's remains still lay in the large lidless sarcophagus, along with those of his wife. The Agricola tomb was the outermost of the two buildings along the alleyway, the first to be passed by anyone entering the narrow passage. Attached to its rear wall was the second structure, a tomb-like building of uncertain purpose. There were no burials in it, and no provision for any. Sunk deep into the floor at one corner was a large cistern, a puzzling feature. In the earlier excavations under the main part of the basilica, two of the larger tombs had been found with such anterooms attached, one with a cistern. But those anterooms stood at the tombs' fronts and served as normal courtyards. This room, on the other hand, was attached at the back of its companion, and its only door opened directly into the alley. Between the two there was no interior passage, no access of any kind. Despite these anomalies, the team concluded that the second building still must have been an anteroom, a waiting or resting chamber for visitors to the Agricola mausoleum. Perhaps the lay of the land had dictated its peculiar position. The alleyway itself, at its entrance, had been closed by a heavy ironwork door set in a fine travertine frame. At its farther end, a short flight of steps - rising just behind the monument in the red wall - led up to another burial area, the most distinctive in the whole cemetery. It was not an enclosed tomb but another open courtyard, almost square, surrounded by thick walls, one of which was the northern extension of the red wall. The floor was paved with tile, and underneath, ranged around the perimeter, were spaces for at least six coffins. None of these spaces contained a burial, a curious fact which did not seem a bar to the excavators' conclusion: here was the second-century "burial ground for bishops" which the old documents located adjacent to Peter's grave. The bodies which must have once lain here perhaps had been removed at the building of Constantine's basilica. In any case, there was no provision for cremation burial in this unique open-air mausoleum, and that fact was sufficient to establish it as Christian. It was only with much difficulty that the diggers were able to extend their probe even a short way beneath the white-tiled courtyard that lay spread in front of the red wall. Their persistence brought its reward when they succeeded in finding at least seven graves, of a simpler type, dating to the late first and early second centuries. Revealingly, all seven lay crowded close round that of Peter. There could be no doubt that they had been carefully placed and angled, even crossing and lying atop one another, in order to be as near as possible to the apostle's body. In one of the seven, as Kirschbaum reported, the corpse had "dwindled to a few centimeters of brownish-yellow remains, with here and there the gleam of golden threads, which let us form our conclusions as to the precious garments of the dead man and his social status." Here was the body of an early pope, the archaeologists felt sure, probably one of the ten who had reigned after Peter up to the mid-second century (all of whom had also been martyred). Two of the graves, the earliest and the nearest to Peter, showed that same misalignment noted by Kirschbaum as he lay in the chamber (now computed to be exactly eleven degrees from the right angle). Of supreme importance for the entire operation was the question of dating. In the early fourth century Constantine had found this red wall complex standing, and had enshrined it. But how long had it stood on Vatican Hill before that, just how far back did it go? In order to identify the monument in the red wall as the Tropaion of Gaius, clear proof was needed that it had been in existence by the year 200, well over a century before Constantine. By close analysis of building techniques and structural links, the excavators had already established that all the elements of this central area - the red wall with its niched monument and open courtyard, the alleyway and the open graveyard to which it led - had been built roughly at the same time, certainly within several years of each other. If any one of these elements could be dated, then all would fall into place. In the latter stages of the work, the hope of uncovering some clue to age had been uppermost. The break came when a workman digging beneath the alley reported a drainage ditch lay hidden under the concrete. Extending all the way from the upper burial ground to the alley's entrance door and beyond, the narrow ditch was lined and covered with long, flat tiles. When one of these was exposed to view, its underside showed an embossed symbol, a circular stamp serving as a manufacturer's mark. Quite legible, it soon yielded its meaning. The tile had come from a brickworks owned by the Emperor Marcus Aurelius and his wife Faustina. On the stamp Marcus Aurelius was named as Caesar, showing that he had not at that time been proclaimed sole emperor, and Faustine was given the title Augusta. Exact dates for the events connected with these tiles were available in Roman history: Faustine was designated Augusta in A.D. 147, and it was in 161, following the death of the Emperor Antonius Pius, that her husband was elevated from Caesar to the imperial purple. When four additional tiles were found bearing the same seal, the excavators had their certainty. With full conviction, they concluded that the whole red wall complex had been built after the year 147, but not later than about 165, allowing ample time for tiles already in stock to be used up. This welcome dating quickly led the four to make a speculative jump, spanning the decades back to the apostle's burial. If the monument had been built in the earlier part of the period, say about 150, then Peter would have been in his grave scarcely eighty years at the time. Even at the outside, the interval between Peter's death and the building of the red wall would have covered hardly a century. The implications were obvious: among the first visitors to the new monument must have been some sons and daughters, certainly some of the grandchildren or other descendants, of those Roman Christians who had actually watched Peter being led to crucifixion, who had stood witness as his wracked and lifeless body was lowered into the earth. These first visitors, possessing a very recent and personal tradition about Peter, could hardly have been misled as to the location of his grave. And since the Tropaion had certainly been built by the official church of the period, the pope and his ministers, immediate inheritors of all that had occurred under the bloodthirsty Nero, these too would have had living, word-of-mouth memories of the martyred first pope, and the true location of his grave. There was one final point, adding to the team's certainty about the Tropaion, and helping to fix the date of its construction more exactly. The old document known as the Liber Pontificalis (Book of the Popes, containing material as old as the sixth century) stated that it was Pope Anacletus, near the close of the first century, who had "built and set in order a memorial shrine to the blessed Peter where the bishops might be buried." No trace of a first-century shrine had been uncovered, yet the description did seem to fit the red wall complex, now known to have been erected some sixty or seventy years after Anacletus. During the period 155-66 the chair of Peter had been occupied by a man who bore a name very similar to the earlier pope: Anicetus. It would not be at all surprising, the excavators felt, if the scribe who worked on the Liber Pontificalis had mixed up names that were so close in both time and appearance. While it was now certain that the 1,800-year-old Tropaion stood within the shrine - at least its main elements - the unusual design presented the archaeologists with something of an enigma. Nothing quite like this Tropaion had previously been found from Christian antiquity, and nothing about it, so far as could be seen or deduced, was expressly Christian. Its two niches (a broad upper one with a window-like aperture cut through it, and a lower, narrower one, the two niches separated by a jutting, table-like shelf) could be duplicated only in pagan funerary architecture, and even there only approximately. In several cemeteries of pagan Rome similar structures, though much smaller, had occasionally been found built up against walls. But these were intended to hold urns for cremation burials, not to mark earth-graves. They had box-like lower portions, not open niches flanked by columns supporting a semi-table, and were usually adorned with statuary and inscribed tablets. The Tropaion, on the other hand, stood double the height of these pagan monuments - its original top must have reached well above ten feet - was proportionately wider, and must have been crowned by some sort of gable, perhaps the usual triangular pediment. In any case, this probable derivation from pagan designs was the best the excavators could do in explaining the Tropaion. What exact purpose the two niches might have served, especially the upper one with its curious aperture, why there should be a niche underground, why in the first place the second-century church should have chosen this unique form for Peter's monument, were questions they had to leave unresolved. Before Constantine enclosed the Tropaion in his basilica it had been in place on the red wall for at least a hundred and fifty years, though it could well have been nearer two hundred. During that period, four or five generations of Christians had lived and died, many as martyrs in the spasmodic persecutions that broke out in Rome and across the Empire. Whether in its earlier years the Tropaion had served these generations as a center of devotion could not be determined. But the graffiti wall beside it, with its numerous inscriptions, supplied abundant proof that at least later the site had been a focus for pilgrims. The graffiti wall, as suspected, was not an integral or original part of the complex. It was really an effort, rather clumsy, to repair damage which at one point had threatened the stability of the red wall and the Tropaion itself. 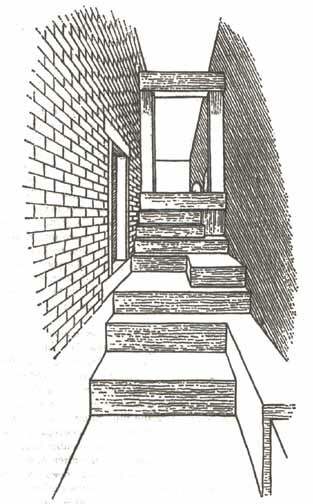 About the mid third century, after the wall had been standing some hundred years, it developed a serious vertical crack, extending from top to bottom and running through the brickwork from front to back, probably as a result of settling. This fault, located only a few inches to the right of the Tropaion, had presented a major problem, one difficult to solve without endangering the monument. Finally, the thick graffiti wall was erected as a buttress, one end of it standing against the red wall and covering the crack. To position the buttress properly the builders had been forced to encroach on the Tropaion, shortening the right edge of the shelf, and shifting its support column a little in toward the center. This move had impaired the Tropaion's symmetry, and over the next few years attempts were made to correct the defect, mostly by putting up small matching wall and lavishing marble all round the lower niche. Nothing could quite hide the disproportion, however, nor did Constantine's architects a century later make any attempt of their own at correction. After slicing off the outer ends of the red wall, they simply enclosed everything in the marble housing. Why they chose to leave the bulky graffiti wall in place when they might easily have dispensed with it, restoring the monument's symmetry, was uncertain. Perhaps, thought the excavators, the wall with its precious freight of inscriptions was by Constantine's day simply accepted as a permanent part of the monument (today the asymmetry is still visible when viewed from the Niche of the Pallia). The picture of Peter's primitive grave, in the years before the Tropaion, had also become sufficiently clear. The burial itself must have been unobtrusive, even hurried, since the Roman authorities would hardly have permitted a public ceremony for an executed Christian, even if Peter's followers had cared to chance it. For the same reason the grave, not far from the place of execution, would almost certainly have been an ordinary one, sunk in the earth, with Peter's body perhaps resting in a coffin, perhaps protected only by the usual slabs of tile (this did not rule out the problematic Senator Marcellus, who might, for instance, have owned the plot of ground). Twice in the following decades low walls were put up around the grave, both to mark it and to protect it from the rising earth on the hillside, a result of the building of tombs nearby. When it came time to build the Tropaion a century or so after the burial, the orientation of the red wall had to conform to the line and arrangement of the imposing pagan mausoleums now hedging closely round the site. This had forced the red wall to cut directly across Peter's grave almost at its center, and at a decided angle. It may have been now that the grave was shortened, rather than later, but in any case, it was evident that the builders had taken great care to preserve as much of it as they could, including its alignment on the hillside. 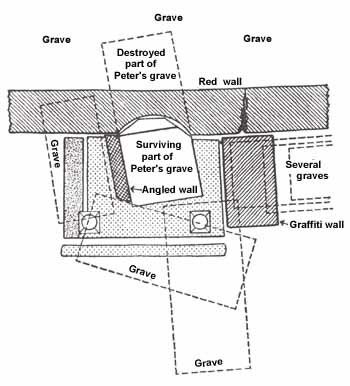 They lifted the red wall foundations over the grave in an inverted V, and left standing a remnant of the two low brick walls in their angled position. The closure slab atop the chamber was also preserved intact, twisting away from the red wall at the same eleven degrees. The whole operation bespoke a strong desire not to lose sight of the primitive grave, while fitting the new monument into the surrounding pattern of tombs. At the shortening of the grave Peter's remains, by then perhaps only bones, must have been collected together in the surviving portion. From this it could fairly be said that the cache of bones found buried under the red wall, though not in the central chamber, still lay in what had once been Peter's own grave, the filled-in half. This did not answer the nagging question of how they had gotten there, though the Saracen threat seemed a sufficient reason for the removal. At the approach of the invaders, the bones had been taken out of the receptacle - whether nor not a bronze coffin - and since the pious attitudes of the time would not allow them to be altogether separated from their original resting place, they had been reburied under the red wall, no doubt with the intention of restoring them to the central chamber when the danger had passed. As the centuries rolled on, they had simply been permitted to remain under the wall. Normally, graves have no history, not even the history of their development … their zenith is at their start. What comes after is disintegration. This is true not only of the modest graves of ordinary mortals, which barely last for two or three generations, it is true also of the world's proudest funerary monuments, the royal pyramids of Egypt or the gigantic mausoleums of ancient Rome. True, they have endured for thousands of years, but in gradual decay. At that remains is a dreadful shadow of their onetime magnificence. Few graves on earth have transcended this interior rhythm of death and disintegration. And these are not the tombs of the mighty ones of earth, but those of the saints, who even after their deaths live on in the world with a mysterious effectiveness - among them, this apostolic grave with its remarkable and mysterious power, and an influence that develops through the centuries. By the close of 1945, work at the shrine was virtually complete, and preparation of a full report was under way. Planned to fill two oversize volumes, detailing and illustrating every step of the work beneath the high altar, with many photographs and drawings and a lengthy text, the labor of compilation and writing would be formidable, delaying publication for several years. Since the Pope had already designated 1950 as a Holy Year, it was decided that appearance of the report during that time of special observance would be most fitting. The first official announcement to the world would be made personally by Pius XII on the day before Christmas, 1949. Meantime, even though rumors were already circulating, no information was to be given out. The bones had been found, said the account, in a "subterranean cell" about twenty feet down beneath the high altar, where they had lain in a "terracotta urn." All those concerned in the project the Times explained, had for the time being been sworn to secrecy. Technical and other problems delayed the printing of the report and it was not until over a year later that the Pope, speaking by radio, made the news official, at the same time taking care to correct the emphasis. "Has the tomb of St. Peter really been found?" he asked. "To that question the answer is beyond all doubt, yes. The tomb of the Prince of Apostles has been found. Such is the final conclusion after all the labor and study of these years. A second question, subordinate to the first, refers to the relics of St. Peter. Have they been found? At the side of the tomb remains of human bones have been discovered. However, it is impossible to prove with certainty that they belong to the body of the apostle. This still leaves intact the historical reality of the tomb itself." The Pope's reserve in the matter of the bones was strictly accurate. Still, though many wondered what was meant by the phrase "at the side of the tomb," the belief quickly gained ground that these mysterious bones must be those of the apostle. In the total absence of any evidence to the contrary, such a conclusion on the public's part was almost inevitable. When the report finally appeared some months later - two huge, expensive volumes intended for the world's libraries - it contained a photograph of several of the larger bones lying at the edge of the V-shaped opening under the red wall. Special permission had been obtained to replace them for the picture. The accompanying text, in an effort to be scrupulously objective, stated only that "some human bones" had been found mingled in the earth beneath the wall. There was no effort to describe the bones, no explanation of what studies had been performed on them, an no attempt to relate them to Peter. The Pope's conviction about the tomb's authenticity was based, as he said, on all the labor and study of the previous decade. But he had also received, almost at the last moment, word of another discovery, much belated, which had provided the final link in the chain of evidence. Sometime in early December 1950, too late for inclusion in the report, the name of Peter had at last been found in connection with the Tropaion. One of the excavators, Antonio Ferrua, still curious about the marble repository in the graffiti wall, had been canvassing the area one day when, for no particular reason, he stooped and shone his light into the opening. Lying on the bottom in the right corner was a small chunk of masonry, which certainly had not been there even a few days before. Ferrua reached in and took it out, noticing in some surprise that it was a piece of plaster from the red wall. Somehow it had been jarred loose from its position immediately above the marble end-slab, and had fallen intact. 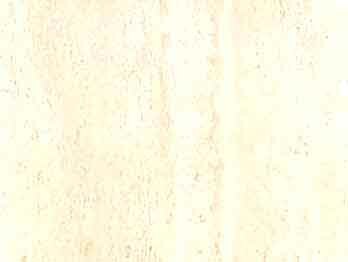 Seen close up, the red plaster was rather rough and somewhat pitted, and at first Ferrua noticed nothing unusual. Then as the light fell at just the right angle, there leaped out at him two lines of scratched letters, all about two inches high: IIETP …, and below it, ENI … The plaster was broken off at the termination of both these words, but it required only a few seconds for Ferrua to see that the first was Peter's name in Greek, (Petros). The second line, incomplete as it was, presented more difficulty. Perhaps it was an invocation for prayers to the apostle, a point which could be settled only by the missing letters. At any rate, the second word hardly mattered. Here, beyond cavil, was Peter's name at last, scratched on the wall above and just to the right of his grave. 10. 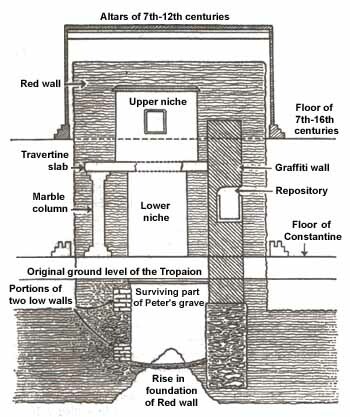 Front view (simplified) of the red wall with its niches, the Tropaion, and the graffiti wall, in relation to the underground portions of the monument and Peter's grave. 11. 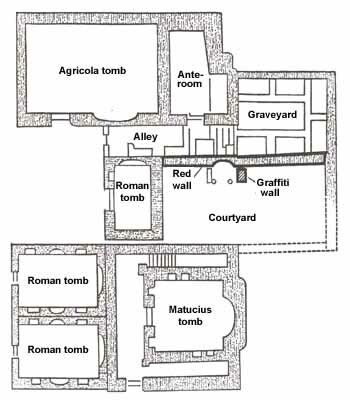 Overhead view of Peter's original grave showing its angled position in relation to the red wall, and some of the surrounding first - and second-century burials. Obviously, the inscription had been written on the red wall prior to the erection of the graffiti wall in front of it. The fact, and its use of Greek, which by the late third century had almost disappeared from Roman usage, made a date as early as A.D. 200 not unreasonable. This was almost too eerie a denouement, and as the four excavators eagerly examined the unmistakable scratches, they could only shake their heads in wonder. What ever had brought the piece of plaster down from its inaccessible position on the red wall there was no denying that it had come at just the right moment. It was a fittingly dramatic conclusion to the unparalleled ten-year adventure. Ordinarily sober men, in the circumstances the excavators could hardly be blamed for looking on this concluding stroke of fate as somehow mystical. But it was not a conclusion, mystical or otherwise. In reality, because of an earlier act of fate, less kind than the closing one, the long search for Peter's relics was about to enter a new phase, one which could never have been foreseen, hardly even imagined. Nine years before, during the excavations at the shrine, something had happened of which the four archaeologists had remained totally unaware. A blunder had been committed, a startling blunder, which had left the results of the excavations seriously flawed. The unlucky perpetrator was the conscientious Monsignor Kaas himself. A serious-minded official, inclined to silence, rather peremptory in his manner, Kaas had carried his responsibilities as nominal leader of the excavation team heavily. Though he knew little or nothing of archaeological technique, in his concern to avoid what he saw as irreverence or the threat of serious damage, he had frequently given unwelcome advice and directions to his four colleagues. Occasionally, acting on his own, he had caused things to be done which had annoyed and even angered them. Kaas, on his part, had increasingly viewed the archaeologists as too blunt and casual in their methods, even insensitive. Perhaps inevitably, the operations under the basilica had not been many months old when the breach widened, and soon nearly all direct contact between Kaas and the team had ceased. They seldom met and when they did they were never more than polite, with only necessary maters being discussed. It was this lamentable atmosphere, unguessed by outsiders at the time, which had made the blunder possible. It was Kaas' practice late each evening, after everyone had departed and the excavations lay quiet, lit dimly here and there by night lights, to tour the whole area accompanied by one of the foremen of the Sampietrini, Giovanni Segoni. Almost never present during the day's work, on these daily tours Kaas would inspect every detail of the most recent digging and dismantling. As the work beneath the body of the basilica brought to light stray parts of skeletons, he had made it his personal duty to see that no human bones should, in the confusion of cleaning up, become mixed with the mounds of dirt and debris and be accidentally thrown out. Whenever bones were found, including an occasional skull, he had them placed in special boxes and stored away for reburial. The other four knew of Kaas' inspection routine and grudgingly accepted it, though they were seldom informed of its daily results. One evening early in 1942, a day or so after the team had first exposed the graffiti wall and peered briefly into the man-made cavity, intending to return later for a closer look, Kaas had come to the area on his rounds, along with the foreman. Segoni, flaking off some of the plaster rim for a better view, inspected the cavity with a light. When he reported what appeared to be a number of bones mixed with some debris, Kaas unhesitatingly told him to remove them for safekeeping. Breaking off a few further bits of plaster from the hole's edge, no more than necessary, Segoni began handing out the contents. Besides lumps of mortar and brick which had fallen down from the wall-fill above, there were many human bones, all bleached to a stark whiteness. Reverently, Kaas placed them one by one in a box. Segoni then swept his hand over the bottom slab, as far as he could reach through the small aperture. Along with gravel and bits of plaster, he picked up some more fragments of bone, some shreds of cloth, a few thick threads, and two corroded coins. These things he also place in the box. Then at Kaas' direction, he wrote out a label on a small card: "ossa-urna-graf" (bones, graffiti urn). Several days later the four archaeologists, after completing their disappointing investigation of the Pallia Niche, returned to the graffiti wall. Intent on the exciting culmination of their search, an entry into the central chamber, they never noticed that the opening into the cavity had in the meantime been slightly enlarged. Making their own inspection of the curious repository, they found only the bits of debris that Segoni's probing hand had missed: some threads, the bits of metal, the Limoges coin, and the few chips of bone.